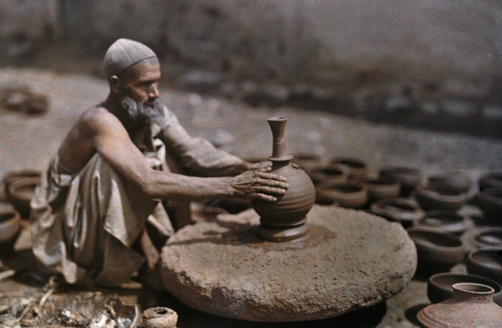 In 1927, a year after his wife died, Franklin Price Knott (1854-1930) at the age of 73 embarked on a 40,000-mile tour of Japan, China, the Philippines, Bali, and India during which he took a lot of photographs using a then recently developed technique of creating color photographs - autochrome. These vivid images of his travels created a sensation in America. 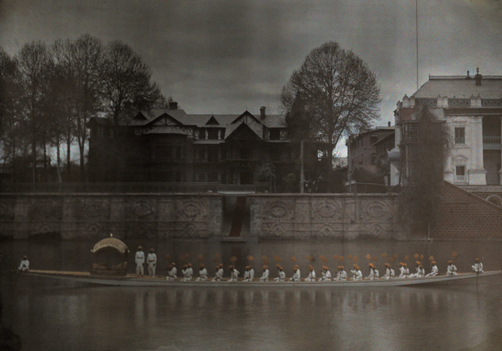 Franklin Price Knott was one of the first to have his color images appear in National Geographic magazine. 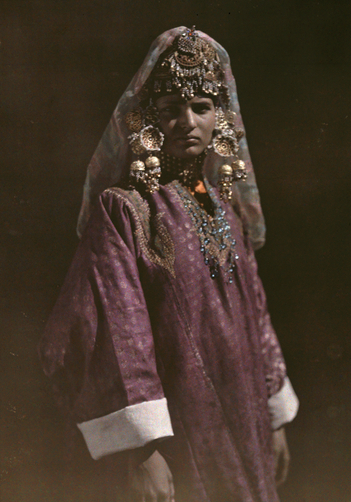 Today Franklin Price Knott is credited as one of the pioneers of color photography, for giving public an appetite for color and in developing this appetite, Kashmir played a vital role as the scenes colored by him for Kashmir are believed to be his best work. 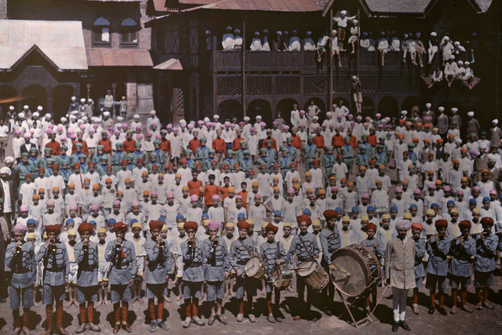 Franklin Price Knott's Kashmir was printed in October 1929 issue of National Geographic Magazine. 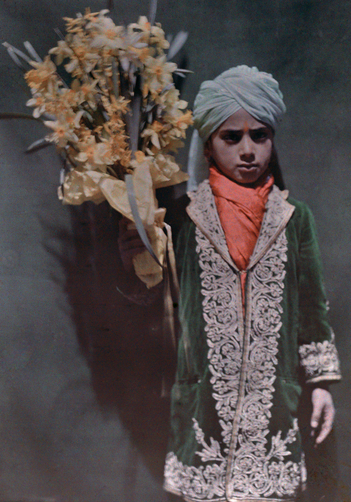 A boy awaits the arrival of the Viceroy and Lady Irwin with flowers. Jammu (not Kashmir). Native state officials float downriver to meet the Maharaj. 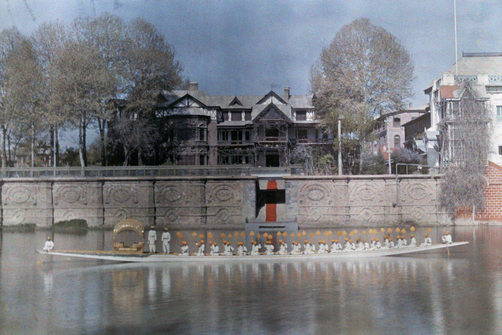 Srinagar. Students of a school [C.M.S] gather outside for photo. Srinagar. 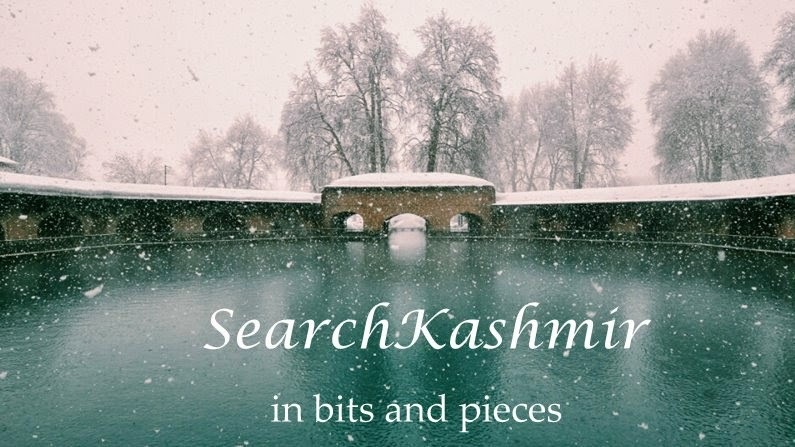 "The Maharaja summoned me to the green and blue tiled pool in the royal palace at Jammu where he was bathing with a dozen natives diving and splashing. After the swim servants brought to him tray after tray of exquisite jewelry; pins, necklaces, rings and bracelets. From some trays he would select a piece and wave the rest away. When I finally photographed him with his aides, he was wearing, I was told $4,000,000 worth of pearls. 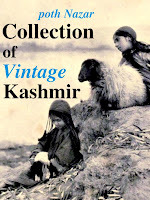 It is regrettable that in this Vale of Kashmir surrounded by glitterng ice-capped mountains and considered the world's most beautiful valley, there are almost no womeen except those of the laboring classes, to be seen. It is contrary to social custom for women of the better classes to be seen on the streets or in public places." ~ an American news report from 1927 of Franklin Price Knott's trip to Kashmir. Here are some other photographs of Kashmir published in National Geographic over the years (minus the more recent ones). Their site offers no information on year of the photograph. So here I have added some additional notes. Now Rewind.